Adding two-factor authentication to your application is the easiest way to increase security and trust in your product without unnecessarily burdening your users. This quickstart guides you through building a PHP, Laravel and AngularJS application that restricts access to a URL. Four Authy two-factor authentication channels are demoed: SMS, Voice, Soft Tokens and Push Notifications. Ready to protect your toy app's users from nefarious balaclava wearing hackers? Dive in! To complete the quickstart today we'll use PHP 7.0+, Composer, MySQL, and the Twilio PHP Helper Library. Let's walk through installation below. Skip ahead if you have already installed one. When doing PHP web development, we strongly suggest using Composer for package management. This quickstart relies on Composer to install the Twilio PHP Helper library. You can find manual installation instructions on the PHP Helper Library page. You'll need a database for storing Authy IDs when a user registers in this quickstart. For this demo, we built our user database on top of MySQL 5.x. When installed, start it. If you're using the default MySQL credentials (as below), create schema account_security with an admin user homestead and password secret. Clone our PHP repository locally, then enter the directory. Next, copy your Authy API Key from the Authy Dashboard and set the API_KEY variable in your .env file. You should get a message your new app is running! If your phone has the Authy Client installed, you can immediately enter a Soft Token from the client to Verify. Additionally, you can try a Push Notification simply by pushing the labeled button. 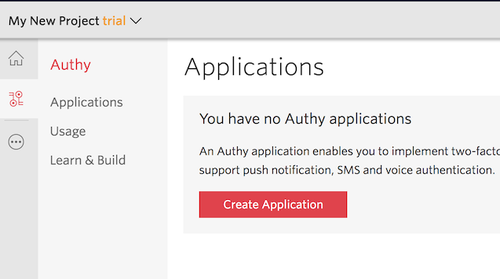 And there you go, Authy two-factor authentication is on and your PHP/Laravel app is protected! Now that you are keeping the hackers out of this demo app using Authy two-factor authentication, you can find all of the detailed descriptions for options and API calls in our Two-factor Authentication API Reference. If you're also building a registration flow, also check out our Phone Verification product and the Verify Quickstart which uses this codebase. For additional guides and tutorials on account security and other products, in PHP and in our other languages, take a look at the Docs.